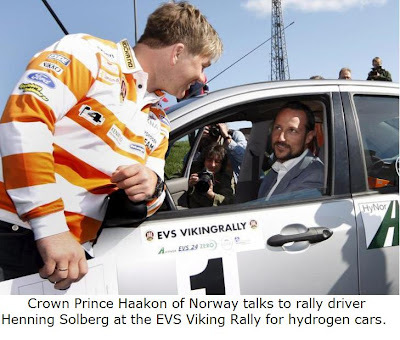 THE MONARCHIST INITIATIVE: Crown Prince Haakon joins opening of "Hydrogen Highway"
Crown Prince Haakon joins opening of "Hydrogen Highway"
HRH Crown Prince Haakon Magnus of Norway joined the first stage of the EVS Viking Rally, from Oslo to Lier, together with internationally renowned racing car driver Henning Solberg. 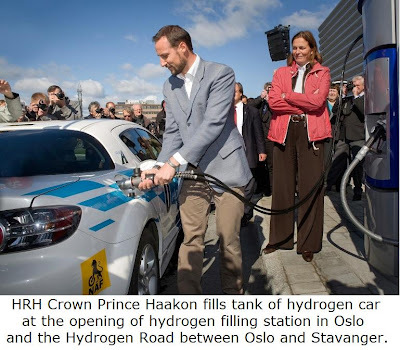 The Norwegian "hydrogen highway", HyNor, was officially opened by Norwegian Transport Minister Liv Signe Navarsete on Monday 11 May, at StatoilHydro's new hydrogen station in Oslo. The EVS Viking Rally 2009 is an international rally for hydrogen cars, electric cars and plug in-hybrid cars.